This clock uses 180V. Make sure you are familiar with risks involved in working with high voltage circuits. Never touch the back of this clock while the power is on. You, the builder and user, bear the responsibility for your own safety in building, testing, and using this clock. By purchasing this clock, you acknowledge the risks involved in it's operation and accept those risks as a result. I will in no way be held responsible for your actions, including your death by this device and you accept these terms by building and using this clock. MSP430 Nixie Clock kit contains all parts necessary to build the clock (requires 9V-12V DC power supply, not included.) Protective clear acrylic front and back plates are available as an option (see images.) Face plate can be mounted horizontally (flat) or vertically (raised front.) This version includes new features like battery and minute/hour separator, several new software features, like cathode poisoning prevention effects. This version of the clock uses less energy and is quieter than the previous versions. I've wanted a Nixie clock for years, and had my eye on this one for several months. It exceeded my expectations. Shipping: The kit shipped a 10 days after I placed the order, but this delay was communicated by the seller in his product description. The components were securely packaged and arrived in perfect condition. Communication: I contacted the seller several times after ordering. His replys were prompt and curtious. Great nixie tube clock kit! I really enjoyed building this kit. I completed it in a few hours on a rainy Sunday afternoon. The documentation was well written and easy to follow. The most difficult part was reading the tiny markings on two of the diodes. The circuit board and other parts were very high quality. I didn't have a 9-12V power supply but I had a 14V 1.2A supply that worked just fine to test it. The plexiglass enclosure was nice as well and makes for a nice display to show off the entire circuit. Finally, the price is very reasonable which explains why Rob can't keep these kits in stock. If I make any change, I might replace the blue LEDs with some "purple" UV LEDs to give the nixie tubes more of a purple "ionized gas tube glow" which is more natural to me than the obnoxious blue light. How long did this take you to design? I enjoyed this kit so much! The PCB is very clean and well laid out. How long did this take you to design? It was a process :) First design was done in Sept 2014. You can see the progress on 43oh.com. Cheers! Enjoyed putting it together; instructions were clear and well illustrated. 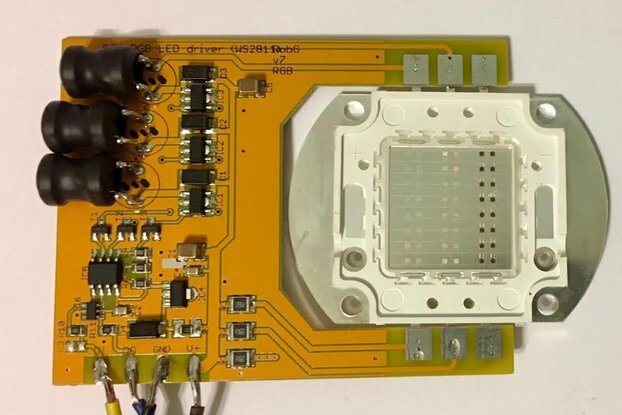 My only comments would be maybe making the firmware open-source, and maybe using a different coin cell holder; the current one stick out pretty far from the PCB. Clock's firmware is open-source and is available on 43oh.com's forum. Fun build, really cool finished product! Everything about this kit is well done. The board itself is beautifully laid out, and including the close-up photos of all the components to help in identification is a nice touch. I may put it in a different enclosure of some sort to keep dust out, but straightforward assembly and great finished product! Did not need to contact the seller. 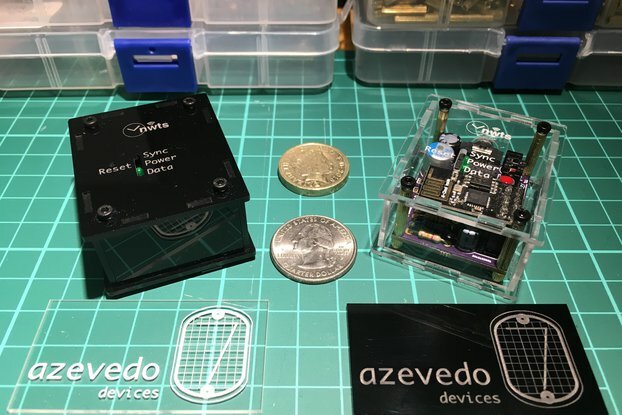 Great kit, and something I've wanted to have (OK, well anything with a nixie) for about 50 years, ever since I saw them in probably some Popular Electronics or HAM radio magazine. I'm glad I stumbled onto Tindie on Twitter via a few makers who'd mentioned the kit being in stock again. The kit went together well, and I really appreciated the close up photos of the different components to help differentiate them. Especially with the capacitors and diodes. I was pretty pleased when I gave it power first time that it lit up and worked! Doubts were only in my own mind RE: my soldering, etc. and not the kit. One little comment in terms of instructions. I had to look a few times to confirm that you really were supposed to solder the body of the crystal down to the board. If not for the photos I'd probably have missed that part. Great kit that looks good and is fun to put together. The PCB is very clean and well laid out. It looks wonderful assembled. The clock works wonderfully, makes almost no noise,and does not get warm at all. Everything arrived very well packaged and the instructions were fantastic. There are a lot of parts and a lot of solder joints so set aside some time to finish this project if you want to do it all in one sitting. Might be my favorite build ever. I had a blast putting together this kit. Having never soldered nixies nor neon tubes before, I was really looking forward to receiving the shipment and getting started. Everything went in without a hitch. I tend to be one of those people who likes to make sure beyond any doubt that I'm doing everything correctly before I put tip to solder, so I would have loved photographs of every part. If you like working with other people while soldering like I do, I would recommend watching the build video 12voltvids put on YT. I found it helpful. Finally, one capacitor wasn't exactly the same as the one listed in the documentation, but it was a perfect substitute and Rob got back to me quickly with all the info I needed to complete this project correctly and with confidence. The final product is beautiful and I had a great time putting it together. When it's back in stock, I might buy a few more just to have fun putting it together again with friends. Thanks for a wonderful product and experience, Rob! My first nixie clock kit. Good price fast shipping. Had question about one component and seller clarified quickly. Kit went together in about 4 hours. I like the tth mounting of the components. Finished the kit, put the case on, and plugged it in. Guess what, fired right up not a problem with the clock. All the settings worked. Best of all 16 yoa daughter said it was awesome!! Thanks for a great product. Only down side is case is extra cost. But with the initial cost of the clock not bad. Maybe include case with the clock and it’s HV hazards. Just my .02. Thanks again. Might be getting another or two to build as gifts. Great kit. Assembly was straightforward. Read everything before you start. Component identification is at the end of the build instructions. Overall this is a great kit. I will have to build another one. Only good soldering ability and technique required. Download instructions which are above excellent. Watch YouTube video Kit#2 build. Take your time and follow instructions and you’ll have fun. I paid a little extra for the plexiglass covers and hardware. Well worth the$20 and very nice! Great kit, easy to follow instructions, and it looks beautiful! This is the least expensive nixie tube clock I could find, yet it is still high quality. This was a great project and was easy to follow and install. It would be nice to have sockets for the nixie-tubes vs individual pins provided in the kit. A case option to fully protect the 180v would be a welcome addition to the kit. All in all this is a great product that was shipped quick and produced epic results - the person I made it for absolutely loved it. This is the one to get. Very well packaged. I had no problem assembling and I do recommend the plastic case if you are not supplying your own. The setting is of the clock is straightforward. The kit had great documentation and I have had no issues with my clock so far. Rob has a good product here and I look forward to see what he will do next. I'm an electronic kit hobbyist. 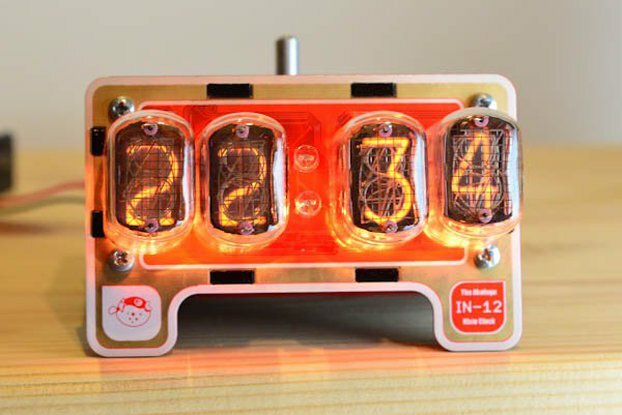 I've always loved the look of Nixie Tube Clocks but couldn't find a kit at a reasonable price point until I came across this one. I decided to get it and it is a great little clock kit! The instructions are very clear, well laid out and quite easy to follow with both large pictures and drawings of the area and components you are working on. The circuit board is well laid out and I love the black color on both sides. While I'm not the best with a soldering iron, the component and via layout make my execution of the kit look like it was done professionally. I have only two VERY minor negatives for the kit. The "case" consists of two flat pieces of clear plexi that sandwich the clock with nylon standoffs. It does leave portions of the board carrying 180V somewhat exposed. I would appreciate the availability of a more complete case option. The other negative is the LED back-light. While the blue LEDs look good, an option for a different color would also have been nice. With that being said, this is an excellent and great looking Nixie clock kit at an extremely affordable price. I would highly recommend it and will probably buy more of them in the future. Great job, sir! I ordered this kit with the acrylic case. I built it over the course of a few days - I'm an experienced solderer, but I'm also lazy. It probably took no more than 2 hours total. The documentation was extremely clear - I particularly liked the information about identifying the parts like the diodes and smaller capacitors and I'm sure it'll help increase the confidence of anyone building this kit. The description of the menu/interface is also very well-done, and I sent this part to the recipient (it was a gift). When everything was complete, it worked the first time (nothing I build ever works the first time!) and I never had to contact the seller (the instructions were just that good). The board is laid-out so well, and the case puts it at a nice upward angle for viewing. I left it on for a good day or so to make sure it was keeping good time but also so I could stare at it. Great kit for a great price! The recipient loved it, too. Lately I've been on a binge of DIY kits and this one is a clear standout. The Instructions are very clear and step-by-step. The materials are clearly labeled and I had no quality complaints at all. My clock worked the instant I put the power in and I can't stop looking at it. I had an issue downloading the docs and Rob responded almost immediately on a Saturday, I couldn't be happier with the clock. I see myself definitely ordering another in the near future for a gift. Junk boards and horrible customer service. I purchased the product expecting an item that COULD be assembled and used. After a short time I realized the boards are substandard with weak solder pads, incorrect documentation, failure to operate at all. I emailed a few times and was somehow talked into buying another. This again had same result. At his request I shipped one back for him to "repair". After 3 weeks I was told he couldn't repair it (despite claiming he could after initial diagnostic) but he would send a replacement. After another 3 weeks I inquire on my replacement and I'm told "I don't do free replacements". Not sure if this seller is bipolar or what may cause his ping pong match of claims and promises to denial and dishonesty. Had great hopes but let's face it...you get what you pay for. As the cheapest kit on the net, you get exactly that. The kit is easy to assemble. The instructions are excellent. Finished kit is an absolute joy and the price is right! These tubes are just the right size. I prefer them to the vertical tubes. If you have any interest in Nixie clocks, grab one of these. Brought it to the office to show it off and folks loved it. Most of them are too young to have encountered tubes at all. Lots of nice features like the cathode anti-poisoning routines and very easy to configure with just two buttons. It is one of the few clocks in my house with a battery backup. Thinking of getting another one to build as a gift and another one to tinker with; replacing the stock blue LEDs with RGB LEDs. From across the room the orange numbers surrounded by the blue glow really looks fantastic as the colors become blended and take on a purple tinge. Stunning! Highly Recommended. This NIxe tube clock went together with no issues and no missing parts. The components are packaged and grouped together for each step of assembly. The instructions show the components in color for easy identification. What a wonderful Nixie clock kit. Purchased this as my second Nixie clock as a youtube project build. The video documenting where all the parts go can be found on my youtube channel 12voltvids. Only suggestion I can make is to ship outside the US. There are many buyers outside the US that would want this project. I am in Canada, and had to have it shipped to my US mailing address. I would have gladly paid more to avoid the inconvenience on having to drive down to get it. Thanks for your review and your video! I bought this kit because it was the best all-inclusive Nixie clock for the money, and it ended up being an even better value than the price indicates. It is all through-hole soldering, the instructions are easy to follow and have great photos to guide you, and the clock functions are very easy to understand. I have only completed a handful of electronic kits, but this clock was easy for me to assemble. It took me two and a half hours in one sitting, and I didn't run into any unforseen trouble. I had absolutely no negative experiences with this kit. Absolutely AMAZING service, and a fantastic product. I was somewhat of an amateur solderer, and once assembled, my nixies didn't function. In diagnosing the situation, I ended up causing a short, which damaged several components. Rob was *incredibly* helpful in helping me fix the clock -- to the point where I had to physically mail it back to him. He fixed a number of issues, and mailed it back working perfectly! Rob went above and beyond all expectations to help me end up with a working product. I'll be bookmarking his site, and I'll happily buy any new and interesting products he develops. In a world where the overall quality of customer service seems to be dwindling, Rob has managed to maintain a superior standard of service that is both comforting and refreshing. This kit was amazing. Straight forward instructions and fun to build. Not only that but Rob is an amazing seller who stands by his project. He worked with me via email to help diagnose where I had went wrong in my build. I was able to eventually find my mistake in building this with Rob's help. He did not have to do this but went above and beyond to provide excellent customer service. Now my nixie is working great. Great product and great seller! I found the kit well documented, fun to put together, and quite reasonable. I love it and would recommend it to anyone with some soldering skills. I do wish the acrylic guard plates were available separately after the fact. Acrylic plates (and replacement parts) can be purchased separately, just send me a message. Built it over two consecutive nights while wranglin' my kids. Awesome little clock, I look forward to integrating it into a 3D printed enclosure. Great work! It was hard to read the diodes, and resistors, had to ohm them out to verify values before putting on the board. The nixies arrow was confusing, the docs should have just said to match pin one with the board to nixie. the arrow on the board for nixie viewing didn't work for me. The IC sockets were kind of cheap and didn't take well to taking the chips out and back in for testing. I did not get the unit to work, tested power supplies and nixies and the counter chip, all OK. One neon lamp was broken, and I think the 340 chip is bad, since I can't get any thing out of it. If I put the chip I can force the Nixies to light per digit. I will use the nixie board with a daughter board for the clock functions since everything else works. Contacted vender and he just wanted to see my soldering work via pictures which I don't think would work good. I have been building projects for 50 years starting with tubes in high school then heathkits to pi's and other projects. Sorry to hear you have issues with my kit. The reason I want to see pictures of the board is to verify that everything was assembled correctly and the there are no issues with soldering (more than half of the issues I deal with are related to soldering.) All Nixies and Neons are tested before shipping and are packed in bubble wrap. MSP430s are programmed and tested manually, so I can guarantee they are good. If there's anything I can help with, let me know. I really wasn't seriously shopping for a nixie tube clock kit, but when I saw how reasonably priced this kit was and how great the reviews were I couldn't say no. It went together smoothly and the directions are very straight forward. My only criticism would be to be more detailed in the orientation of the tubes. I don't know if they would be damaged if powered up while upside down. With a little careful looking, I was able to confirm that the anode looked different and that that position is labeled on the board. Most people would figure this out, but at this price, I image that a lot of people new to soldering and electronics are going to be building this. Shipping was quick and packaging was sufficient. Hi and thank you for your input, I will update my documentation with tube orientation details. Also, Nixie will not get damaged if inserted upside down. Superb quality kit, with perfectly illustrated instructions. Had fun building it, and the finished product is awesome! Love it! This is a really neat looking nixie clock. Took a couple of hours between work projects to solder it up. So maybe an hour for me to do it. I would recommend using RA flux when you solder the pins for the Nixies in. I used MG #835 and it worked perfectly. I put the flux on all of the pins then put a blob of solder on my iron (A real Hakko 888). The touched the solder blob (60/40) to the pin. Soldered it in a second without overheating the tube. Also i noted that in the nixie tube, there is a pin that has white ceramic surround (inside the glass). That is the Anode pin and should line up with the silkscreen on the PCB. The pins are symmetric so you can put it in backwards. I didn’t notice in the manual that it was noted so i thought i should mention it. Another thing, put it all of the chips before you put the battery holder and the other tall parts in. Same for soldering in the DC jack. Put that in before you solder the other components in that cover or are near it. That would have been good to know before i did it. But with some fancy iron movements i got it all. Also get the Acrylic case, its really nice and makes the clock a lot safer to have around. So all in all, i would definitely recommend buying it! So many great things so say. It started with an email to RobG with questions about the features on his kit. Less than a day later and 3 separate email responses I knew I had found something cool. My shipment arrived safe and sound. It was very neatly packed, all components were well organized in various baggies with plenty of bubble wrap to keep the delicate bits intact. The documentation was clear and concise with plenty of detailed pictures. The board is very well designed, and looks great. The kit went together very smoothly, even for someone with zero previous soldering experience. Another plus is that RobG has provided the source code in case people want to upgrade/add features to their clocks. Great kit. Awsome old time soft glowing tubes! Great instructions and documentation. If you have decent soldering skills this kit goes together very easy and looks great when it's done. I recommend the plexiglass shield just to keep curious fingers away from the 180 volts. Got my kit in the mail on Monday, spent a couple hours this evening assembling. Very impressed with the quality of the kit, and the thought put into what components were in which baggies, such as keeping all of the very similar looking transistors separated. Build instructions were very well laid out and in a very logical order. Including a resistor decoder sheet was a welcome addition compared to other kits that just give you the values for each resistor. I never can remember what color means what value, and end up spending more time than I should staring at a key. Almost had a fit though when it didn't work the first time I plugged it in. Was able to troubleshoot it myself by comparing against the very detailed photographs in the instructions, and found that I had reversed both a capacitor and a diode, like a bonehead. Once I reversed those to the way they should be, everything worked as advertised. Can't wait to build a case for it, and put it out where everyone can see it. I ordered the MSP430 because I wanted to see what the Tindie customer experience was and because it looked like a cool kit. Placing the order with a credit card was simple and easy and I received the kit in only 5 days. The documentation was good and I had no trouble assembling the clock in 1 evening and 1 afternoon. Once assembled, everything worked just fine. I brought up everything one section at a time, first testing that the 3.3 VDC regulator was working, then that the microcontroller was sending signals (I have an oscilloscope) and then turning on the 180 VDC power supply. I just bought some black and gray smoke acrylic sheets to make a box for the clock so I can hang it on a wall. At $39.75 USD, just the Russian nixie tubes are worth the cost of the kit. My only suggestion would be to add an alarm function in the firmware. You could just add a few more numbered functions to add an Alarm Hour, Alarm Minute and Alarm On/Off setting for the clock. An alarm event could flash the numbers and the LED backlight for a set time (30 seconds or so to eliminate the need for a snooze button). I will consider alarm clock for my next version. Great product and true professional. I've been looking for an affordable diy Nixie clock for awhile now. I came across Tindie and Rob's site. This look like an awesome clock and the price is great. I'm a beginner, so I had some problems after I finished the kit. I emailed Rob and he helped fix my clock. Rob is a professional and I'm going to buy another clock very soon. Thanks for your help. Wonderful Nixie Tube Clock kit by very good price! This is quite wonderful and well-designed Nixie clock kit. 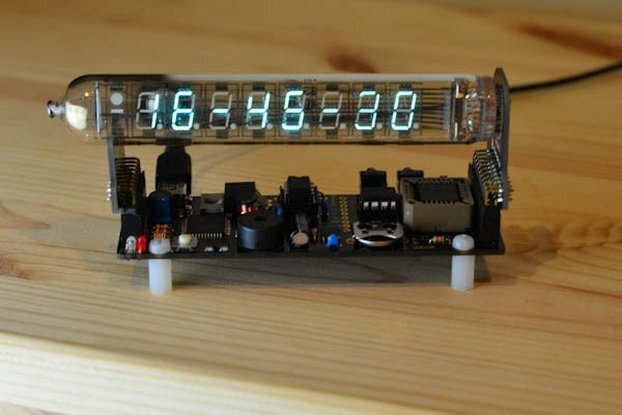 In general, 4-digit Nixie clock costs more than $100 but this is just $35! Not only its good price, the circuit is quite well designed and very easy to assemble. Firstly I was embarrassed because no assembling information was not in the box but quickly find the link to document at tindie's item site. I would recommend this wonderful kit for all. Wonderful! This was a great project! I've been looking for a cheap way to build a Nixie clock, but felt like it was too pricey for cheap kits. This one was easy to build, documentation was good, and easy to get running. Great project!!! Any clock involving nixie tubes operating at >100VDC absolutely requires a case that prevents inadvertent contact with high voltage. But what's sold as a case here is simply two plexiglass sheets that cover the front and back only, leaving all four sides open. Of course it's possible to fabricate a case for the thing. But I shouldn't have to. I received the order quickly, and it came in perfect condition. It looks amazing, and I can't wait to show my friends my new nixie clock! Received it quickly, built it in three casual evenings. Could have easily built it in one sitting. Communication is EXCELLENT. I had a problem and emailed my issue and received a reply the next day. Turns out the problem was totally my fault in having one of the chips improperly seated in it's socket. For the price this is an excellent nixie kit, it's a simple clock. Oh, another fun thing, I write software for a living and the MSP430 chip is programmable and I just might try my hand at modifying the C code that runs the clock! I was able to complete this in a but two hours total. Documentation and instructions were easy to follow and even with limited soldering experience, it worked the first time. This was my very first attempt at something like this and I couldn't be happier with the result - I have a fully operational Nixie clock that makes me smile every time I gaze at it .. I goofed up with the power supply using AC instead of DC but Rob was quick to reply and diagnose the issue. I'd recommend this kit to both veterans and careful novices without hesitation. Again - the result is an incredibly cool clock ! When I received this kit, I immediately was transported back to my younger days building Heathkit projects. I apparently went back too far and didn't realize I installed the LM1117 backwards. Needless to say, it didn't work. After some troubleshooting with Rob, he agreed to send me a replacement AT NO CHARGE. Once that was installed, I was good to go! Excellent customer server and a wonderful kit!!! Great kit! Documentation very clear. Easy and fun build. Only took a few hours to assemble. The finished kit is top notch and rivals nixie kits that cost much more! Fun build and you get a really cool clock too! I have nothing but good things to say about experience. 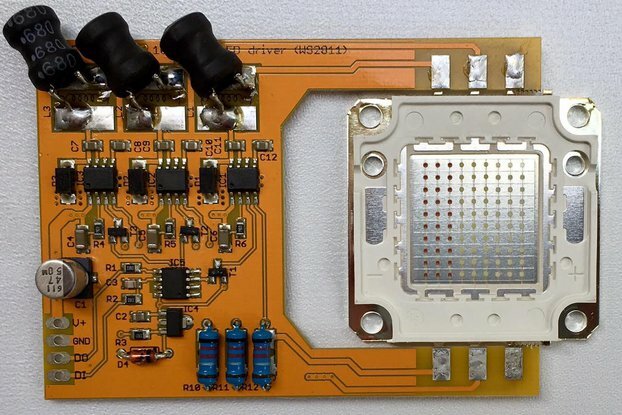 The pcb is well made and thoughtfully planned. The documentation is easy to follow and the clock, well, it's a nixie clock and for under fifty bucks! It simultaneously keeps time and looks cool. I had a small problem owing to a power issue. Rob got me on track straight away. Would I recommend this kit? You bet! Update. My nixie is still running a year and a half later. I still very pleased with it. The clock seems to run a little fast gaining up a couple of minutes a month, no big deal as it is easy enough to set. I stand my my original recommendation. It is a great kit for a great price! I've wanted to build a Nixie clock but other kits are too expensive. This one is a give away I think. Easy to build. Mine had a problem with the 180v power section which was traced to a bad diode. I replaced this with a 1N4007 and all was well. Looks great. It does not have battery back up so looses the time on every power up but the time is easy to set. You need to supply 12VDC at about 350mA. The blue LEDs make it look great. Since the Nixies are multiplexed they are not too bright but fine. A note to the designer: add a mode to run seconds as it is really fun to watch the Nixies and once a minute is too long to wait. Maybe a seconds count for the minute and hold the time for a bit, then count again. I purchased this kit as a birthday gift for my tech nerd boyfriend. The kit was shipped quickly and packaged well. I didn't have any hiccups that required conversing with the seller, so I cannot accurately rate "communication". "The kit was well thought out, well documented, and a pleasure to assemble. The online assembly video was helpful, and I'd recommend this to anyone who wants a well done nixie clock kit. The only thing I would maybe add to make the clock even better is a battery backup." While I don't think this would be a good kit for a beginner, it is fairly easy to build. The circuit board is high quality and labelled well. I agree with others that the really small parts are hard to identify, but Rob's assembly guide helps. The one thing I wish for is a battery backup so that I don't have to reset the time when it is powered off. Awesome product, extremely happy with seller. I ordered one Nixie clock, built it and d/t inexperienced soldering burnt out one of the chips. I had a very tight deadline for a birthday present, Rob was kind enough to ship me a second clock, pre-built as well as the spare chips to fix the original quickly. Luckily the replacement chips fixed the original and i was able to give my grandfather the clock i build on my own, housed in an oak display box with a glass lid. Now i have a the second nixie clock for myself in the same type of enclosure and love how it looks. The birthday present was a hit and everyone who saw it was very interested. Wouldnt hesitate to order again. p.s. Tindie really needs to fix their image linking, I was unable to upload an image and ive seen several posts say the same. This is an awesome clock kit at a great price. The kit is well fabricated, very well document and simple to put together. I have already ordered another one to give as a gift. I hope to see more kits from this seller, they are a real value. I hope in the future we see a kit with six digits, battery backup and the ability to turn the tubes off on a timer :). 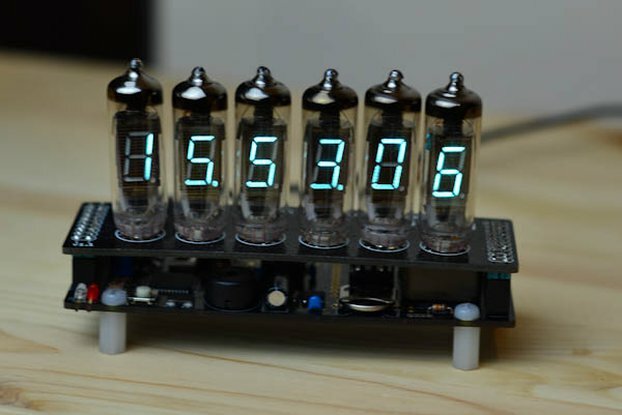 I would recommend this kit for anyone with a love of the classic nixie tubes. Great kit for an amazing price. Assembly was pretty straight forward, only took about 30 minutes. It's been running for a few weeks now without loosing a minute. On first power up I thought I did something wrong because only the back lights came on. Turns out the power adapter I was using didn't have enough current. Swapped it out with a different one and it came right up. The only thing I would change would be to add some additional de-bounce to the setting switches. With the price point I can imagine Robg is going to have a tough time keeping up with demand! Just got around to building it. everything went smoothly. I decided on the led being from the back side. I had in mind to encase it in wood so I didn't purchase the clear case option. For the Nixie tube , the A on the board correspond to the arrow on the tube if you're wondering what direction the tube is. I had to rank the communication in the review.... I didn't need to communicate with the seller. All was good. I really enjoyed building this kit. I also appreciate that Robert included the option to purchase plastic front and back plates with the necessary spacers. One word of advice to purchasers - the resistors and ceramic capacitors are quite small and I found the color codes and printing on the caps a bit hard to read; not Robert's fault of course. I suggest having a magnifying glass and a volt-ohm meter available to confirm that you are selecting and placing the correct parts. Robert included a schematic, parts placement diagrams, and an great PDF showing the pictures of each of the parts - all very helpful. I would definitely purchase any other kits Robert might offer in the future. I got finished assembling the clock today and a loving it. The only thing that is missing from the documentation is usage instructions. But, it didn't take me long to figure out what each of the two buttons does to program the device. Suggestion for improvement: Add a RTC so that the owner doesn't have to reset the clock each time after the clock was turned off. Also tried to upload an image to this review but that failed 5 times so am giving up on that. While not a trivial build due to all the various resistor levels, it was not particularly difficult. The instructions are very clear and easy to follow. I opted not to install the blue LEDs so I could get a more old-school look. The final result is beautiful. I love this clock. One note is that it does emit a bit of a high-pitched whine; I wouldn't want to sit next to it all day, although many people probably wouldn't even notice it. Thanks for selling a fantastic kit! When I was a kid in the 70's my dad and I used to make clocks from old frequency counters - this was a fun, nostalgic, kit! The leds that came with the kit might have been mislabeled as they work, but not at the 3v (that seems a reasonable voltage after the resistors to me...) I measure at the solder pads. Frankly, the display without the blue leds is much more in tune with my memories - I doubt I'll rummage through my parts to find ones that work. I have paid _much_ more for kits of this quality! looks like you have discovered a problem with PCB. The latest PCB batch has a missing piece of track. If your LEDs don't work, please contact me and I will let you know how to fix it. Awesome; blue LED back-lighting of Nixie tubes looks great! This is a great clock kit with very clever led/blue back-lighting of the glass "nixie" tubes - which gives it a unique and attractive appearance. Assembly is straight forward - although there are a lot of soldered joints to make and it will take some time if you want a neat/clean finished board. Allow 3 hours to do the job well and ensure you have a soldering iron that has a small tip. Here are a couple of pointer: a) for the power supply, ensure that the center pin is positive (the usual convention). Also, read the comments or watch the video to learn how to use the push button controls (both these points should be covered in the installation instructions IMHO). Also consider purchasing the perspex case if you don't have plans to build your own. One other point: in the assembly instructions, there are a couple of images to allow you to choose between mounting the glass tube LEDs either on the front of the board, or into a central hole on the rear of the board. These images don't point out, that in the photos, two nixie tubes are shown with "front" lighting, and two are shown with rear lighting. I'd recommend lighting from the rear. Would I buy another one: Yes - actually my son already wants one... :) Question to the (talented) designer: When is the 6-tube version (HH MM SS) coming out with an option for a 1 pulse-per-second input to sync the time to a GPS chip? Completed this kit today and it works! It did take a while to summon the courage to install Soviet-era vacuum tubes. Once I was past that, it was easy. All parts are included and everything is well marked, so no mysteries in assembly. It even runs on a 9 volt battery (not sure for how long). Thanks for explaining how to set the time. Details: the Nixie tubes use the same shape for 2 and 5. The 5 is an upside-down 2! Easy, Gorgeous, and Affordable Kit! I saw this kit come up in Tindie’s twitter feed, and instantly knew that I wanted one. It’s relatively inexpensive, not very complex, and it looks amazing (especially with the acrylic front and back plates). And Nixie Tubes! I love the effect and being able to see the inner workings of these very much Old School display devices. The build was pretty straight-forward, and I’m really happy with the final product. It turns out that Rob was sitting a few tables down from us at NC Maker Faire last year, so it was neat to connect with someone local. Thanks Rob! I just finished building this Nixie clock and really enjoyed it. The circuit board is very well designed and the Nixie tubes look great. I like building electronics kits for the fun, the learning, and the relaxation - for me it's like a jigsaw puzzle on steroids. This was a perfect weekend kit. Update: pictured here with a very basic 3d printed enclosure. I totally forgot to put an opening for the buttons, so that'll be the next print. Fantastic kit! The parts were well laid out and were easy to solder. Instructions were nice and clear - Rob also provided documentation via Email which was nice. I will probably tweak the code a bit - but that's the nice thing about this type of kit :) Clock is easy to use, setting the time and brightness is very easy. Looks phenomenal on my desk (I got the extra acrylic front plate). I personally like the blue LEDs (although I know a lot of others don't) - but they're optional and can be dimmed or disabled via settings. I somehow managed to get the last kit that Rob had in stock. I wanted to solder everything as soon as it arrived, but the web site with the documentation was down. Wrote to Rob and he emailed me a copy of the docs by the next morning, though by the time I checked the web site was back up again. The instructions are clear and easy to follow. I made one mistake because I didn't read the entire part on the LEDs: I soldered them straight to the board. I should have realized they were intended to go through the holes, but it was the last step and I was excited to be done. I don't think I'll use them anyway, but I've ordered some replacements from Mouser and I'll solder the new ones in the correct place just for completeness. The clock looks fantastic, and I love that it has settings for 12/24h mode and for the backlight brightness. I suppose I should probably find a spare tube for when one eventually dies. I got it hooked up in about two hours. Works just great. I do think I'll move the LED's to the backside. Amazing Product and Amazing Help! I did not have much experience with electronics (other than a circuits class in college) going in to this and was able to put this together with ease. I had some issues with the digits not working and Robert was able to help me over email very quickly. His help and instructions were awesome. This is the cheapest kit I have found and was so much fun to put together and I love it sitting on my desk. The power supply is a little cheap (mine fell apart) but I was a little rough with it and just ended up shoved the PCB back in, it still works. Overall very pleased! Very economical and easy to build nixie clock. This is the first Nixie clock I have built. I was going to build my own from scratch but it's much easier building on a premade pcb. Worked with no problems except one of the blue LED's was bad. I replaced it with another I had. I would highly recommend this kit. There could be small improvements such as battery backup but of course this would increase the cost of the kit. Very economical for a simple Nixie clock. I bought this for my husband for Christmas and he loved it. He put it together and it's being displayed proudly. Great kit at a nice price with PS and Case. Very easy to build, take time to sort the resistors. Haven't had a kit this good since HeathKit disappeared! I put more filters on the LEDs - cut from a grey static bag. At setting 1 they were still too bright. One suggestion on any revision. Put a blinking colon or blink the background per second. THANK YOU for such a great product!!! This was well designed and fun to assemble. Having built these kinds of things in the past, I really appreciate the efforts that went into this kit. It is obvious that a lot of thought went into it. The LED backlights are a great embellishment, nice touch. It worked with no problems encountered. The excellent part photos were very helpful for I.D. I found that the resistor color code is hard to read with my older eyes so a multimeter was essential to verify the values before soldering them in. I plan on buying more to give as gifts for friends. The documentation was perfect for my skill level but a beginner may need more ? Hard to say. Can't recommend this vender enough. Was very easy to assemble and fun to do... Yeah, I had a geek smile the whole time. Powered it up and worked perfectly... beautiful work. There was 1 piece missing from the kit (3.3k resistor) or it would get 5 starts across the board. Clock went together well, documents were clear and easy. Price is great and I love the way this thing looks. Response to my questions was immediate. Thanks a ton! Will hopefully post another pic once I get the enclosure finished. Considering you got the kit #1, 1 resistor missing is not that bad I think :) I will make sure this is corrected.